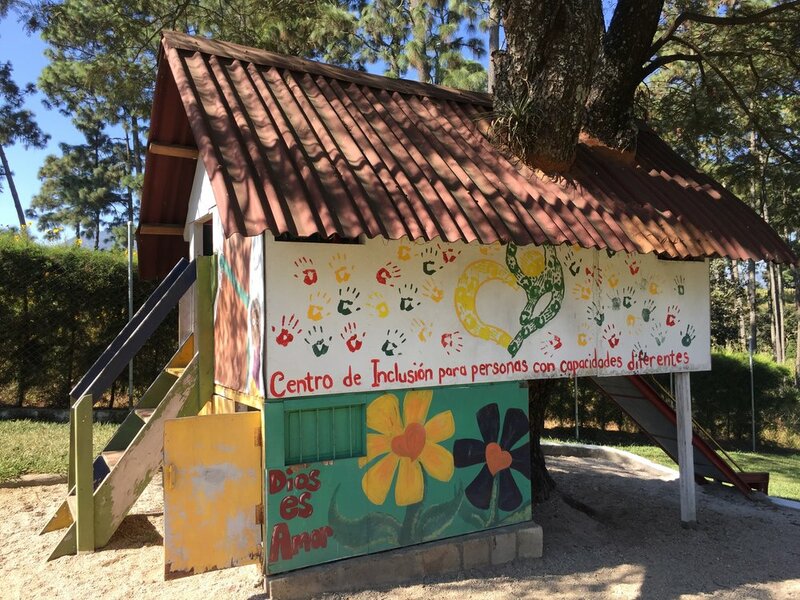 The programs that the Embrace International Foundation supports help to pay for professional services, such as physiotherapy, occupational, speech and play therapy that benefit children and youth with Down syndrome, autism, infant cerebral paralysis and severe behavioural disorders. The organization provides both material and emotional support to the parents of special needs children. Embrace’s primary partner organization in Central America is CIPECADI of Guatemala (friend them on Facebook). This is an excellent organization led by Irene Ordonez, a social worker with an expertise in serving special needs children. Embrace’s support to CIPECADI has included assistance with building a petting zoo for the children as well as the purchase of a therapy horse for children with autism. Additionally, Embrace recently provided 65 mothers with household staples in time for the Christmas season. In Africa, Embrace is working with the Kyaninga Child Development Centre (KCDC). This group is located in Fort Portal, Uganda, and provides high quality professional services to disabled children throughout the greater Fort Portal region. This organization will be receiving free motorcycles from Embrace to assist them with their outreach program to remote Ugandan villages. Reviewing the excellent publication, Disabled Village Children written by David Werner of Where There Is No Doctor fame, will clearly demonstrate much of KCDC’s work. Visit KCDC at: www.kyaningacdc.org. Motorcycles have become critical public health tools in remote areas of the developing world. They are able to reach rural regions quickly and inexpensively and Embrace uses small dual-purpose motorcycles in its overseas programs. Embrace’s motorcycle tours take small groups of experienced riders to some of the most isolated corners of the world. Uganda in East Africa, and Guatemala in Central America, are two of the countries where Embrace conducts tours. The point of the tour is to have the guest rider provide Embrace with the funds required to buy a new motorcycle for one of its overseas partners. The rider will then be given a guided tour of Embrace’s fieldwork and at the end of the tour turn his or her motorcycle over to one of Embrace’s partner charities. New motorcycles, accessories, insurance and local taxes, cost approximately $6,000 in Central America and $7,000 in Africa. However, each participant receives a tax receipt for the full cost of his or her motorcycle. Additional expenses for food, lodging and gas are to be covered by the visiting rider, but Embrace will take care of all of logistical support and trip planning. *The costs of new motorcycles may change from time to time and are subject to currency conversation rates. Guest riders are also required to purchase their own airfare. If this alternative means of seeing the world and supporting poverty reduction interests you - please make application to join CC’s company of philanthropic adventures.